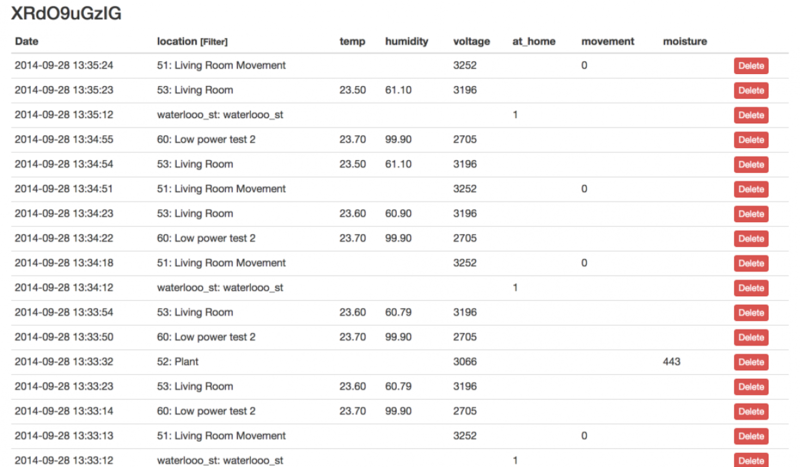 DataStore is a data logging service similer to Xively and Sparkfun's phant. I built it after want to do more with the data I was collecting than just display it. DataStore allows time series data coming in from different sources to be stored and then viewed, it also allows graphs to be created plotting different pieces of data vs time. For me the key difference between DataStore and the alternatives are the triggers, these can be set to monitor data as it comes in and then perform various actions. Currently this is sending a push notification, for example when the water level in a plant drops below a set value a notification is sent to my Pebble watch. The system is built on Laravel and uses Amazon's SimpleDB service for the data store, this was chosen as its highly scalable, at least for a reasonable volume of data and its very cheap. SimpleDB is a non relational database and is used for storing the data coming in, everything else goes into standard relational database. This is my first full open source project and is available from github for anyone to use. The system is not currently feature complete but has enough features to be useful.